Hello! I had a random FO thought the other day.. I read a little discussion somewhere lately about how Hux is not likely to be a big threat in IX.. Sorry not sure where LOL.. I think there are hints Hux is a threat to SL Kylo- and this may have been foreshadowed. Not just through Hux going for his gun while Kylo was unconscious on the floor of the throne room, or that last conniving look at the end of TLJ. He's extremely conniving and ambitious, and well he personally hates Kylo/Ben and force users in general! Because he commands the FO army, I think Hux can be a legitimate threat to Kylo/Ben. This is foreshadowed by Luke's declaration that a Jedi can't face down the whole FO army with a laser sword. In the end, Luke does this - as a force projection, but it does indeed cost him his life. We also saw many Jedi surrounded and taken down by an army when order 66 was activated and the clone army turned against them. A jedi [or force user] cannot take on a whole army alone. Qui-Gon replies: Perhaps I killed a Jedi and took the weapon from him. Anakin: I don't think so. No one can kill a Jedi. Qui-Gon (quietly): I wish that were so. Should Hux be able to turn the FO army against Kylo/Ben, even with his force powers, Kylo/Ben is not going to be able to defeat it alone. For this reason alone - I can't disregard Hux as a genuine threat in IX. Beyond this, Hux has a track record of working doggedly on technology in order to defeat his enemies and rise to power, and he has done this in secret - choosing the right moment to reveal is technological advance- he could be working on something now that is going to be a legitimate threat which force users like Rey and Kylo/Ben are significantly threatened by. I love how all this has been set up and I'm looking forward to whatever the makers come up with in IX! I don't doubt whatever - we'll have a significant threat for our fave people to face and conquer in IX! 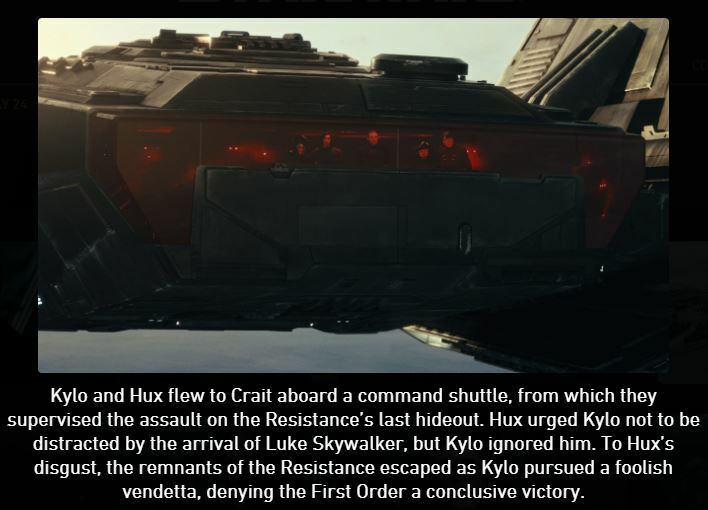 One other reason I think Hux can be a threat - Crait was a humiliating failure! One last comment while I'm in the FO thread! A random thought i had.. When Hux went for his gun while Kylo/Ben was unconscious... Kylo need not have worried. 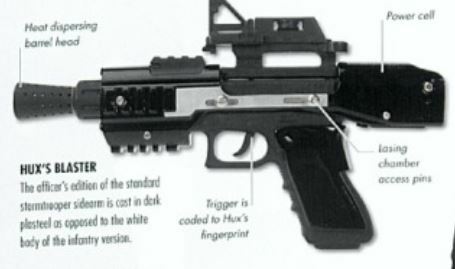 We were told in the TFA visual dictionary that Hux's gun has a fingerprint reader that means only Hux can shoot it. LOL. Hux is wearing gloves, so how could he have activated it?! I would actually like to see tensions between Finn and Poe, crazy as it seems. Because I think Finn has the potential to be a great leader, more even than Poe. He has a deep sense of right and wrong, which led him to overthrow his conditioning and leave the FO, and although he makes mistakes he isn't as rash with other people's lives as Poe. But what I can see is a rift becoming between the two of them if Rey's link to Kylo is discovered. Do any of the Resistance know Rey was on the Supremacy? Do they even know how Snoke died? Because if Rey is mistrusted by Poe over the Force bond I see Finn having to make a fateful choice between his friends -and I am pretty certain he'd choose Rey. @DeeBee If they can make Hux a phantom menace for ST I would be clapping. Yeah, he looks puny but he is also cold and humilated and has no empathy or compassion. A villain doesn’t need to be some kind of ancient deformed or insane monster. Its funny I don’t see him being too much calculating like Tarkin for example, but go full on crazy like Jonothan Crane. Nice catch about the gun LOL. I think Hux would make a great 'big bad' - he wasn't anywhere near as humorous in TFA, and Domhnall has the acting chops to pull it off. @SkyStar wrote: @DeeBee If they can make Hux a phantom menace for ST I would be clapping. Yeah, he looks puny but he is also cold and humilated and has no empathy or compassion. A villain doesn’t need to be some kind of ancient deformed or insane monster. Its funny I don’t see him being too much calculating like Tarkin for example, but go full on crazy like Jonothan Crane. Whoooo phantom menace?! I LOVE this SkyStar! Indeed on the surface he is at times a bit of a dill... but he does have quite a long history of bumping off his competition. A long list.. the visual dictionary even shows the FO officer who is Hux's go to guy for assassinations. I think Hux can be very calculating - but his weakness is that he trusts his simulations and technology too much - he doesn't think creatively in battle.. this has been hinted at but umm right now I can't remember where. @motherofpearl1 wrote: I think Hux would make a great 'big bad' - he wasn't anywhere near as humorous in TFA, and Domhnall has the acting chops to pull it off. We'll see! Yeah I agree Hux wasn't funny at all in TFA - when he was ranting at a massive FO rally and murdering billions of people in a moment. Pure evil. The fact that there were a few jokes at his expense in TLJ doesn't rule Hux out as the big bad in IX - though I understand for others it does. I agree Domhnall can totally pull it off- good call! I can't help but think the being made a fool of in TLJ is going to really infuriate and motivate Hux toward maximum evil in IX. Especially when leadership of the FO is soooo close he can taste it! I think Hux's POV could be: He knows he is destined for better than being tossed around like a rag doll by that Kylo Force using scum- and he is going to make him pay. A thought struck me the other day - that time and again we see in SW that it is the threat you don't see coming that is the most dangerous and effective in defeating you - the Jedi overlooked and underestimated the Sith's resurgence, the Emperor underestimating Vader and his love for his Son/ Luke's bravery, and we had Snoke - as Rey so directly stated in the movie - underestimating Luke Skywalker, Ben Solo and Rey. "... who would have guessed that the girl Rey would be so slim and fragile-looking? She looked lost in the throne room, dwarfed by both her surroundings and the galaxy-shaking events for which she was the unlikely and unwitting fulcrum. But Snoke knew appearances were often deceiving—sometimes fatally so. Underestimating Rey had nearly cost Kylo Ren his life, after all. Snoke knew better. For he had his own legions of uncounted dead, their ranks filled by those who had underestimated him." For me, if the makers so choose, Hux is already set up as a potential big bad in IX that many fans will not see coming - but in hindsight they will look back and maybe wonder why they let a few jokes at his expense distract them from his ruthless evil. I think there can be an awfulness to finding that the person you overlooked as a sniveling fool, actually bests you in battle - even temporarily (as I hope will be the case for Rey and Kylo/Ben lol!). It gives wanting to fight to get out of their clutches an additional dimension.. like your dignity is at stake! The horror that this could be how you are defeated and how your life ends???!!! !- by that rabid Kurr??!!! gah!!!! Nooooo!!!!! And all the while Hux is indeed showing how truly evil he is. Am I making sense? There's a horror to that which is terrifying! It could also be true there is another threat I'm completely overlooking - LOL.. I'm open to anything! I feel if they didn't make Hux the big bad in IX it would a wasted opportunity. Domhnall Gleeson is such a great actor and he could pull it off- you just love to hate him and RJ playing him for comedy relief in VIII will only make it a bigger surprise for the GA when he turns out to be the "Big Villain" in IX. Indeed! Plus that look....that is the look of someone plotting Ben's/Kylo's demise. The focus on him was very quick, yet it is chilling. At that moment, I felt Rian was quickly changing the focus from comedy relief to serious threat, and tossing the ball to J.J.
Plus, because Hux craves power (especially emphasized in the novelization) - the plotting of....and actual overthrow of Ben/Kylo is greatly foreshadowed. First order at Ikkrukk during the battle of Crait. Hello! The Poe Dameron comic #30 was released this week, and there's a few new snippets about the first order. The timeline here is that this takes place at the same time as the battle of Crait, but I thought it might be best to put here as this may be relevant to IX. hope that's okay. I won't spoiler as this isn't going to give away the plot of the Poe #30 comic issue..
“They arrived here and told us our system was now under their control. When we declined, they hit us. No Warning.” – ouch. The FO had sympathisers living on Ikkrukk who sabotaged their defenses - double ouch. 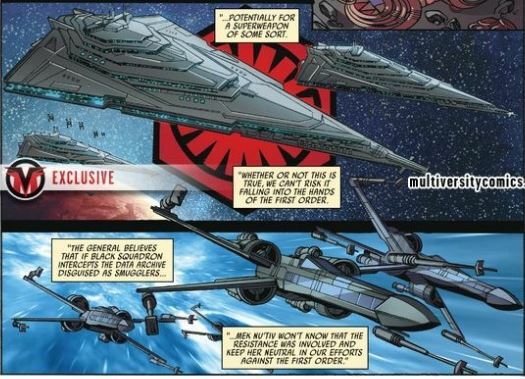 We got a glimpse of something I think may be new.. we have a new First Order ship: Fortitude. And we got a look at the FO leadership heading up this invasion.. Anyone know who these two are? I'm thinking so far they are unidentified. Seems to me the Colonel at this point doesn’t know the Supreme Leader is no more. And.. this is supposed to have taken place during the battle of Crait (the comic started telling us the FO attacking Ikkrukk is ‘during the battle of Crait’). Now this is interesting! Do you think this is significant? Also, interesting that the victory was attributed to the Supreme Leader and not Hux. I guess losing a dreadnought didn't matter! I shared more info about the Poe Comic #30 over at Takodana Woods.. but one thing I mentioned worth repeating is that we learned the FO was jamming the distress calls of Ikkrukk (and Ikkrukk had no idea) - this could explain why no one responded to Leia's distress calls sent from Crait - maybe they were blocking those too.... just a theory..
Anyway- great to get a bit of new content, it's been quiet! Also interesting that this incident occurred without Kylo's instructions as new Supreme Leader -will this be a forerunner of his reign? Of course, no one knows he's now ruler but I wonder if Hux will carry out actions behind his back so to speak, which will cause conflict in the ranks. @DeeBee wrote: Hello! The Poe Dameron comic #30 was released this week, and there's a few new snippets about the first order. The timeline here is that this takes place at the same time as the battle of Crait, but I thought it might be best to put here as this may be relevant to IX. hope that's okay. @Starliteprism - haaaa good one!! 26 August we have the release of the Poe Dameron Annual 2 - so we may find out more detail about the first order in that.. otherwise, we'll have to wait for the release of the final Poe Dameron comic issue to be released on 26 September. I cannot wait to find out who Richard E Grant is playing! There is not a shade of doubt in my mind that Hux will be Kylo's nemesis during episode IX. There has to be consequences of what happened during the Last Jedi and it was subtle but still very clear that Kux wants to put an end to Kylo. If he hadn't waken up in throne room, Hux would have easily hurt him or even worse...kill him. There is a reason why Rian had that last shot of Hux looking at Kylo. It wasn't a "oh you're such a good leader" look, it was written in Hux's face that the moment he has the chance to overule Kylo, he'll do it. hiya! The Poe Dameron Annual #2 is out in a couple of days and I just caught a preview of it..
we have Poe being sent on a mission to secure information about a possible superweapon. We don't have access to the full issue yet, but given the time line (before TFA), I figure this is starkiller base plans..
C3PO's droid network tells him that the FO has done a deal to get this information, and Poe's mission is to intercept it. A data archive dating back to before the rise of the empire? Squeeee! that sounds super interesting!!!! Starkiller base was based on ancient designs? Whoa. What is the origin of these designs?! I eat this stuff up I'm such a sucker! ha! Here's why I'm sharing this in this thread for the FO in IX: 'the data within contains ancient blueprints' - plural?! does this mean there are blueprints for more than one superweapon? This could hint that there is another superweapon/s out there.. and given this would have been Hux's area and not Kylo/Ben's - SL Kylo/Ben may not know about it.. If we get this in the ST, this is the same pattern we saw in the OT. Well technically, blueprints of the Death Star are from before the rise of the empire and Starkiller looks like a big Death star. But if it comes from the Old Republic or even before, I'm not going to complain. This could hint that there is another superweapon/s out there.. I'm so cheering in the theatre if there is again a superweapon. It would be a good troll from JJ towards some parts of the fandom. Personally, I would like for the good guys to use superweapons to show how war is grey in the sequels. This is a scene I believe would be nice to see. But if there is a long time jump, it would give time to Hux to build another superweapon against Kylo and it would explain why he waited so long before striking. And I would be throwing popcorn at the screen- or the whole bucket of whatever I'm eating! That's not trolling the fandom- that would be horrible storytelling, and I doubt JJ would do such a thing. But I agree with you that IF there is a superweapon or the intent to built/use one - it should be the supposedly good guys using it this time. LOL oh yeah.. the death star was sort of around before the empire. I kind of forget that bit! Yeah starkiller did look like a big death star.. but prettier and covered in snow. lol. Starkiller corrupted a whole planet.. typical of the FO I guess! I think there can be a second superweapon without a need for a long time jump - because we don't know it maybe have started being built before TFA and it's still a secret- like the hyperspace tracking, the technology is being worked on and is secret, till it's used successfully.. and yeah I can see Hux would have wanted to keep it secret - to use against a rival..
Just exploring ideas, who knows what we will get in IX! I'd love a line about 'technological terror' in IX! I figure the good guys have a superweapon: the force! Oh and Love! LOL @Night Huntress take heart! If there were to be a superweapon in IX, it doesn't mean that it would be the same. I too would dislike a repeat (yawn! ), but if it is done differently I could totally go with it. But if there is no superweapon, what would there be on the cover of the Shakespeare adaptation? I remember it was an old Lucas' idea to give Death Stars to the new Republic. It was a symbolism I liked, seeing the 'good' guys use the same weapon as their enemy. It could open debate on the state and the legitimity of the power in place. Or it could be just a round ship controlling droids over an invaded planet and I still would be happy. Oooh that poe comic looks really interesting. Maybe it’s the Star forge or something like it? 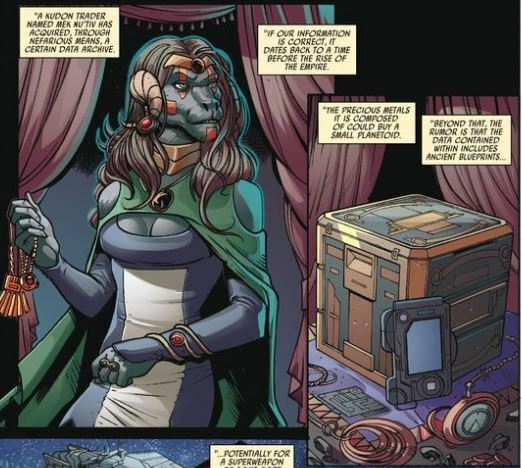 The Poe comic has come up with some really interesting references to ancient artifacts because the kazerhath device was also one of them ( only darksider and light side together can open it but what does it do? )Have been catching up on the comics but still to finish poe ones. Also the reference to ancient blueprints to a possible super weapon remind me of references we had in bloodline novel about an ancient lullaby sung to alderaan children about the mirrorbright ( again though it could have been referencing world between worlds though or something different )and what about palpatine’s observatories ( including the one on Jakku with ancient computers with an ancient map to the unknown regions ) in aftermath novels and now the grysks in Thrawn alliances novel. Just wonder how they will tie all these mysteries together from the novels and comics and whether they will . I can't find the exact quote from the tie-in novel, but there's some quote about Hux wanting 10,000 Death Stars. And that he envisioned himself as Supreme Leader triumphant thanks to his "technological prowess" and ordering around the older Imperial officers (who loathe him for being an entitled little twerp) with Kylo dead and outta the way. Somewhere (maybe here?) there was the hilarious suggestion that IX could have a running gag of Hux wanting to order another Death Star/SKB and getting cockblocked by Kylo because it's been done before and never works. @snufkin wrote: I can't find the exact quote from the tie-in novel, but there's some quote about Hux wanting 10,000 Death Stars. And that he envisioned himself as Supreme Leader triumphant thanks to his "technological prowess" and ordering around the older Imperial officers (who loathe him for being an entitled little twerp) with Kylo dead and outta the way. 10,000 Death Stars would be quite a sight indeed. I would honestly laught if Kylo really says that to Hux. But if I am the devil's advocate, all those superweapons would have worked if there was a competent engineer who made them without hole/target which exploses and destroys everything with just one or two shoots. NB: Evil empires, stop cutting the salary of your engineers to finance your big chairs. @LadyGaufrette I won't be surprised if they have a moment where Hux tries to push a new Death Star program. And Kylo's meta response is to tell him that it's a dumb idea because it's been done before and people always find the flaw to blow it up. Also my biggest complaint about Rogue One was Krennic ordering the execution of all the Death Star's engineers. Anybody who's worked in that profession knows that you always keep around the original inventors because of their technical knowledge (see the examples of people trying to recreate the information put together by the original Ford Mustang Design Team or the Atom Bomb Team at Los Alamos). @snufkin wrote: @LadyGaufrette I won't be surprised if they have a moment where Hux tries to push a new Death Star program and Kylo has to meta moment of telling him that it's been done before. Also my biggest complaint about Rogue One was Krennic ordering the execution of all the Death Star's engineers because anybody who's worked in that field knows that you always keep around the original inventors because of their technical knowledge (see the examples of people trying to recreate the information put together by the original Ford Mustang Design Team or the Atom Bomb Team at Los Alamos). Well, since the Rey's parents moment Kylo is a meta character, why not keep it up. @AhsokaTano wrote: Oooh that poe comic looks really interesting. Maybe it’s the Star forge or something like it? The Poe comic has come up with some really interesting references to ancient artifacts because the kazerhath device was also one of them ( only darksider and light side together can open it but what does it do? )Have been catching up on the comics but still to finish poe ones. Also the reference to ancient blueprints to a possible super weapon remind me of references we had in bloodline novel about an ancient lullaby sung to alderaan children about the mirrorbright ( again though it could have been referencing world between worlds though or something different )and what about palpatine’s observatories ( including the one on Jakku with ancient computers with an ancient map to the unknown regions ) in aftermath novels and now the grysks in Thrawn alliances novel. Just wonder how they will tie all these mysteries together from the novels and comics and whether they will . conclusion to New Republic senators, hoping to batter down the galactic government’s stubborn insistence that reports of a First Order military buildup were at best a figment of the general’s imagination and at worst exaggerations. But a capital ship of that size? That was worse than the darkest imaginings of the Resistance’s intelligence analysts. So was Starkiller Base. What else has Snoke been hiding out there? What a great question!!! I need to go back to the star forge stuff - where was that covered? I"m currently about 3/4 through the final Aftermath book - and am just about to get to the part with the observatory - I am on the edge of my seat to find out what's going on there!! I'm listening to the audiobook and today I met little boy Hux. His glee at ordering the other child to inflict pain was chilling and foreshadowing - he has all the makings of a serious baddie if they head in that direction in IX! TLJ novelisation page 28 & 29 wrote: True, Starkiller Base had then been destroyed, but Hux told himself that was merely an unfortunate setback—one that had been less a military defeat than the product of incompetence and treachery within the First Order. Those failures had been dealt with, or near enough. 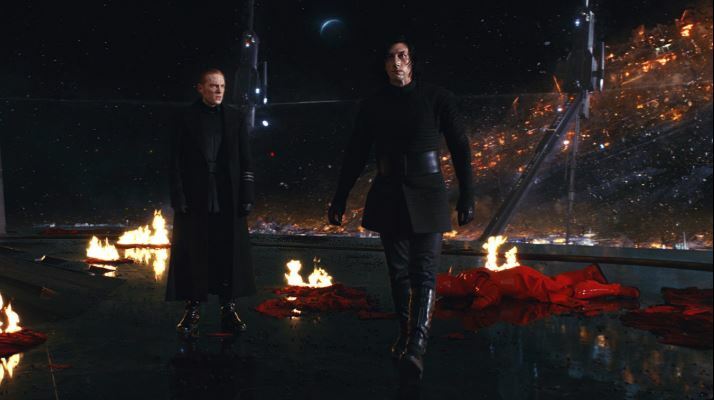 Most of those who had failed Hux and Supreme Leader Snoke had been vaporized with the base; those who’d escaped punishment would get what they deserved soon enough. Hux smiled thinly. Truthfully, it didn’t much matter. The New Republic Senate was in ashes, the heart of its fleet was incinerated, and the Resistance vermin who’d had the temerity to assault Starkiller Base had been careless enough to leave a trail back to their nest. Once these few remaining insurgents had been destroyed, no one in the galaxy would dare oppose the First Order’s dominion. Hux would be free to build a dozen new Starkillers—or a hundred. And in the meantime, the First Order had no shortage of other weapons—including ones Imperial commanders such as Peavey had only dreamed of. That was it right there, Hux thought. Peavey and his generation saw the First Order’s impending triumph as a restoration of the Empire, not realizing how that only proved their obsolescence. They couldn’t or wouldn’t see that the regime they’d served was not merely gone but superseded. The First Order was the fulfillment of what the Empire had struggled to become. It had distilled and perfected its strengths while eliminating its weaknesses. TLJ novelisation: page 31 wrote: Where Kylo Ren and his sorcery had failed, Hux and his technological prowess would triumph. Ah Hux, don't underestimate the force! the bolded is super curious! In the context of the movie, it can be referring to the hyperspace tracking.. but it could also possibly be hinting at other weapons we don't know about yet. There's more - lots of Hux POV about how brilliant he thinks he is goes on for a while. lol. I'll leave it here and maybe share a few more quotes if I get back to it.. or feel free to remind me lol.